Following high-profile collaborations with Sir Paul McCartney and Michael McDonald, Pizzarelli returns to his roots to honor his hero, the legendary jazz/pop vocalist and pianist Nat King Cole, whose centennial is being celebrated around the world this year with various concerts, books and recordings. For Centennial Reasons... completes an epic trio of Pizzarelli albums saluting Cole, starting with Dear Mr. Cole, which helped put Pizzarelli on the map as an influential jazz guitarist and singer in 1994, and continuing with P.S. Mr. Cole, which cemented his legacy five years later. For Centennial Reasons... – featuring John Pizzarelli on guitar and vocals, Mike Karn on double bass, and Konrad Paszkudzki on piano – is produced by John Pizzarelli and co-produced by Jessica Molaskey. "Nat King Cole is the reason why I do what I do," comments Pizzarelli. "The joy that he brought me has never faded and the musicality of his group remains fresh and vibrant to this day. I even got to work with Natalie Cole, Nat's daughter, meet Nat's wife Maria Cole, and become friends with and play with Freddy Cole, Nat's brother. We are lucky to have lived in a world that gave us Nat Cole, the man and the music. "For Centennial Reasons... features several songs Pizzarelli hasn't previously recorded, from timeless well-known ballads ("When I Fall in Love," "Body and Soul," "The Very Thought of You") to idiosyncratic jazz classics (Bobby Troup's "I'm Such a Hungry Man," "Save the Bones for Henry Jones"). 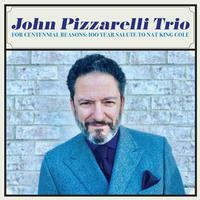 The album also revisits and updates several numbers that Pizzarelli recorded earlier in his career. "After years of performing live," he explains, "the trio has developed and refined these songs and, over time, figured out what we feel have become the definitive versions. Some arrangements, like 'Route 66,' have gotten much faster. But 'Straighten Up and Fly Right,' which I recorded for my first album way back in 1983, has settled into more of a mellow tone. After all this time, I can slow down and savor it. These songs never get old. "In addition to these original takes on recognized Cole standards, this album introduces two new songs inspired by Cole's spirit. "Nat King Cool," written by Pizzarelli, is a sophisticated homage to the Cole Trio's famous instrumental tracks. With his wife, singer Jessica Molaskey, he penned "A Hundred Years from Now," which craftily uses oft-cited jazz phrases to express the essence of long-term romance.